The kitchen – REDBUD Construction Inc. Many experts recommend that you focus on the kitchen first when preparing your home for sale. For many potential buyers, the kitchen is the most important room in the house. Since the kitchen has the power to make or break an offer, you should do everything you can to enhance it before showing your home to buyers. And, most experts agree that next to painting, improvements in the kitchen are the most profitable. Remember though, money you spend here is a cost of selling, you don't want to do a full remodel, but rather take some affordable steps to show what you have in the best possible light. Start by creating space. You want the kitchen to look large, light and roomy. Clear the counters of all clutter. Take everything you can out of drawers and shelves and move it to storage. You can almost count on buyers opening your drawers and shelves when they come to see your home. What you want them to see is space, and plenty of it, not your old pots and pans. Consider paint. Paint is always the most profitable improvement. A fresh coat of light, neutral color paint on your kitchen walls will make them look spotless and new. Exactly the look you want. Pay particular attention to the sink. It should be absolutely free of stains and of course there should be no leaks or drips! If your faucet looks old and dated, consider replacing it with a new one, it will go a long way towards improving the look of the whole kitchen, for very little money. Counter tops. If your counter tops are looking old and tired, you should consider new ones. Remember to stick with neutral colors though. Freshen up the cabinets. 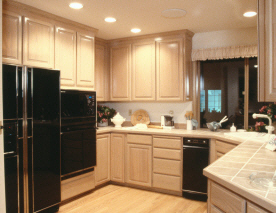 Replacing the cabinets is expensive and probably doesn't make sense. But you can paint them, or put new, modern looking pulls on them for very little money and give them a fresh look. In short, buyers will be quick to notice any shortcomings in your kitchen. 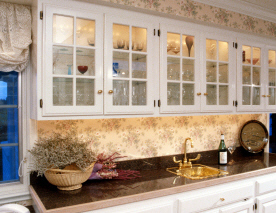 So you want to do everything you reasonably can to freshen up your kitchen and give it a new open large look.